Are Jimmy McGill’s days numbered? Has the Better Call Saul TV show been cancelled or renewed for a fourth season on AMC? The television vulture is watching all the latest cancellation and renewal news, so this page is the place to track the status of Better Call Saul season four. Bookmark it, or subscribe for the latest updates. Remember, the television vulture is watching your shows. Are you? Airing on the AMC cable channel, Better Call Saul stars Bob Odenkirk, Jonathan Banks, Michael McKean, Patrick Fabian, Rhea Seehorn, Michael Mando, and Giancarlo Esposito. This Breaking Bad prequel kicks off six years before Saul Goodman (Odenkirk) became Walter White’s lawyer. In the early 2000s, Saul is still down-on-his-luck Jimmy McGill. He’s trying to negotiate the ethical dilemmas of the legal world, emerge from his older brother’s shadow, and make a name for himself. Armed with optimism and a quick wit, Jimmy is a legitimate lawyer who often finds his ambition at odds with his moral compass. The third season of Better Call Saul averaged a 0.59 rating in the 18-49 demographic and 1.64 million viewers. Compared to season two, that’s down by 34% and down by 24%, respectively. Learn how Better Call Saul stacks up against the other AMC TV shows. On July 28, 2018, Better Call Saul was renewed through its fifth season; season four will debut on August 6, 2018. Stay tuned for further updates. While it has never been a huge ratings success, this critically acclaimed TV series is one of the network’s top-performing shows not involving the zombie apocalypse. Can Better Call Saul build up its audience? Will it be cancelled or renewed for a fourth season? Despite the decline in ratings, I suspect it will be renewed. This television vulture is watching, so subscribe for free updates on any Better Call Saul cancellation or renewal news. 6/27/2017 Status Update: Better Call Saul has been renewed for a fourth season. Details here. 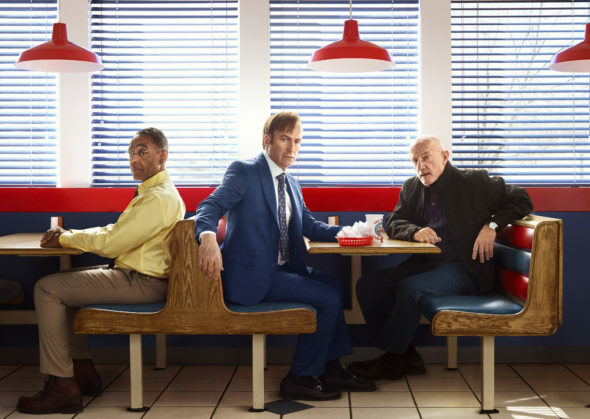 7/29/2018 Status Update: AMC has renewed Better Call Saul through season five, ahead of the season four premiere. Details here. Find more Better Call Saul TV series news or other AMC TV show news. What do you think? Are you glad that the Better Call Saul TV show has been renewed for a fourth and fifth season on AMC? How many seasons do you think this TV series will run? Well, after watching Talking Saul on Monday night, two things seem abundantly clear. (1) is that there WILL be a Season 4 (all of the guests seemed pretty relaxed about this), and (2) is that Chuck does indeed die from the fire. I was disappointed that this was all-but revealed in advance. I thought Michael McKean stole that last episode – it was a phenomenal acting tour de force. Greetings from England. I think networks must consider the replay value of intelligent shows such as Better Call Saul. Perhaps the ratings don’t currently prove themselves worthwhile, but I am sure that MANY people will be paying to see this show for MANY years after it premiers. I didn’t start watching Breaking Bad until 5 years after it premiered. One of the last things that persuaded me was one of my professors kept referencing the show! We love this Better Call Saul! We look forward each week to this. Please do not cancel!!! It all started w/ brwaking bad then lead to better call saul. Please renew it!! I love the show and wait for monday nights to watch it!! Defitnitly need a season four! If AMC cancels this show, I will camp out in front of Netflix until they pick it up! BCS has gotten exponentially better this season! The writing, the story, the direction, the acting… All up to Breaking Bad standards. It’s a subtle masterpiece! If AMC does the unthinkable, then you know the network is truly being run by zombies. Please renew this Show!!!!! This is the best show!!! !